Modify every	aspect of your game control panel. Change the code, design, operation - whatever you	want! Not just a game panel! Control 100's of types of services all of them from one	central	location. Help	your customers quickly! An Integrated support system gives you the tools you need in a game panel. 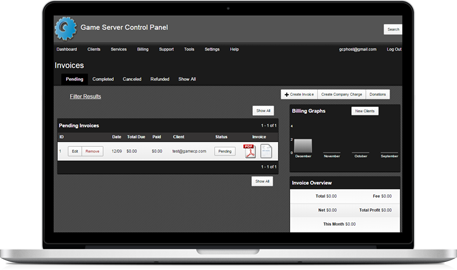 Automate	your ordering and billing processes within your game control panel or use the API. GameCP comes in	a Basic	and	Full version. Full includes ordering, billing, support & the API (required for WHMCS). GameCP is priced monthly & yearly, per machine or with unlimited machines. Check out the game control panel features & start your own trial to see it for yourself. Basic	is good	for	individuals	or clans, those	who	do not need	support	or billing. Full is great for businesses or	those looking to provide services to others. GameCP Unlimited is perfect for businesses with more then 6 machines. Full Version Available for $79.95. This is perfect for businesses who need to do more with a Game Control Panel. Make it how you want to. 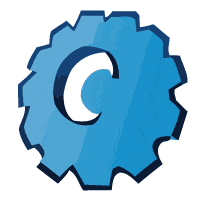 GameCP XV is available in source code form only for a one time fee of $5,000 to registered EU/US businesses. Tweet @gamecp to be contacted. See GameCP XV in action on youtube! Do you want to see GameCP XV? No thanks, continue to site. These are some of the examples we provide, 100's more services are supported. 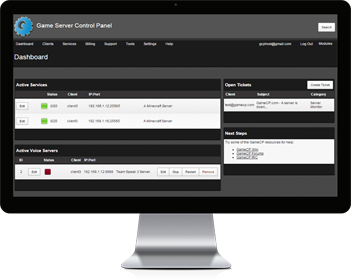 GameCP is a	web-based PHP	& MySQL	control panel for	game & voice servers. You could call it a 'game panel', 'game control panel', 'game hosting control panel', 'game server control panel', 'gameserver panel' or 'game server panel' but we like to call it GameCP. @VeNoMx96 Next month is on us. license should be restored now. @VeNoMx96 Sorry, don't see any payment - reply to your invoice email with the transaction id or order email. If your payment was not applied please re: with your invoice # or re: to the e-mail, we continue to have issues with WHMCS, sorry! Once you've obtained a Trial, Full or Basic license key you can download GameCP.